Artist Katherine Dey has many talents: illustration, sculpture, body painting and making cakes into very morbid shapes. 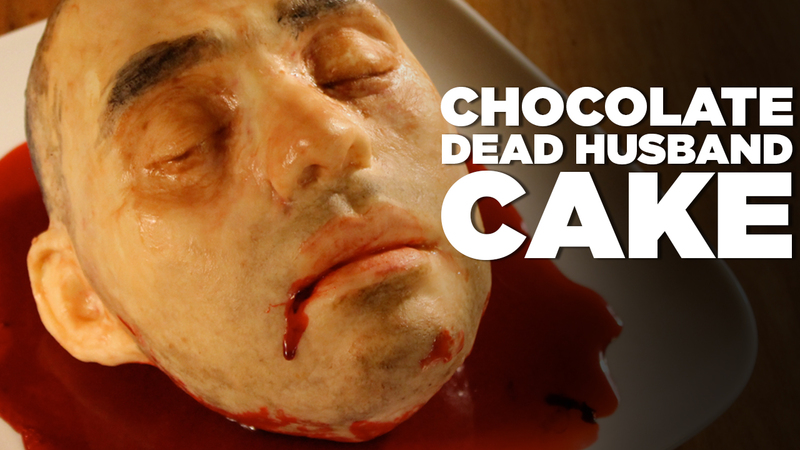 On April 10, Dey shared photos of her latest cake on Imgur: a chocolate-covered Rice Krispies cake made in the shape of her husband's face -- if he were dead and decapitated, of course. Many of Dey's cakes are pretty macabre, actually, including those made into the shapes of a dead pig's head, a roadkill rat, and a dead possum. Her lamprey cake is just plain horrifying. Some are so intense, we can't share them. But not all of Dey's cakes are scary. Her more "sweet" cakes include those in the shapes of a Teenage Mutant Ninja Turtle, an adorable Elmo, and one in the likeness of her father. But even her bee-covered honeycomb cake is a bit off-putting, especially to those with a bee allergy.